IT ISN'T THE AIM OF OUR MODERN DEMOCRATIC PARLIAMENTARY SYSTEM to bring together an assembly of intelligent and well-informed men. The aim rather is to bring together a group of non-entities who are dependent on others for their views, and who can be all the more easily led, the narrower their mental outlook. This is the only way that party policy—according to the evil meaning it has today—can be put into effect. Only in this way is it possible for the wire-puller, who exercises real control, to remain in the dark, so that he personally can never be held accountable. Under such circumstances, none of the decisions taken, no matter how disastrous they may be, can be laid at the foot of the scoundrel who is truly to blame. All responsibility is shifted to the shoulders of the party as a whole. In practice, no actual responsibility remains. It arises only from personal duty and not from the obligations that rest with a parliamentary assembly of empty talkers. The parliamentary institution attracts liars and moles, people who shun the light of day. No upright man, who is ready to accept personal responsibility for his acts, will be attracted to such an institution. That's the reason why this brand of democracy has become a tool in the hand of that race that, because of its inner goals, must shun the open light—as it has always done and always will do. Only the Jew can praise an institution which is as corrupt and false as himself. By contrast, consider a truly German democracy. Here the leader is freely chosen and is obliged to accept full responsibility for all his actions and omissions. Problems are not put to a majority vote, but they are decided upon by the individual. As a guarantee of responsibility for those decisions, he pledges his worldly belongings, and even his life. The objection may be raised here that, under such conditions, it would be very difficult to find a man who would be ready to devote himself to so risky a task. There is only one answer to that. Thank God that our German democracy will prevent the chance careerist, who may be intellectually worthless and a moral slacker, from coming to power in devious ways. The fear of undertaking such far-reaching responsibilities, under German democracy, will scare off the ignorant and the incompetent. Such were the views I formed after two years of attending the sessions of the Viennese Parliament. Then I never went back. Adolf Hitler in Landsberg prison at the time he dictated his memoir. 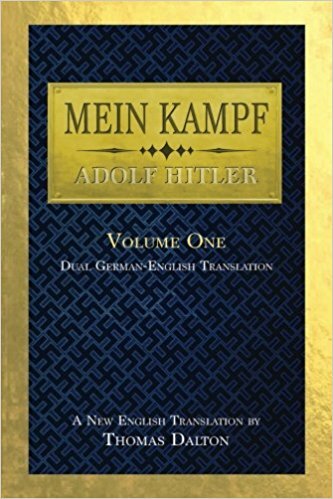 Previous to the following passage, Hitler had been speaking about his strong interest in two political parties centered in Vienna: the Pan-German party and the Christian-Socialist party, and what caused each to fail. Mass meetings in public became rarer and rarer, though these are the only means of exercising an effective influence on people. Here, the influence comes from direct personal contact, and earns the support of large numbers. Once the parliamentary platform was substituted for the beer-hall table, where thousands were addressed, and once speeches were no longer addressed to the people directly but to the so-called 'chosen' representatives, the pan-German movement lost its popular character. It soon degenerated to the level of an academic discussion club. Thus, the misleading impression created by the press was no longer corrected by personal contact with the people through public meetings, wherein a true account might be given. The end result of this neglect was that the word 'pan-German' came to have an unpleasant sound in the ears of the masses. The knights of the pen and the literary snobs of today must realize that the great transformations that have taken place in this world were never conducted by a goose-quill! No, the task of the pen must always be reserved to that of presenting the theoretical foundations. The force that has ever and always set in motion great historical avalanches of religious and political movements is the magic power of the spoken word. This is what Trump used in his great rallies, and he won in a landslide upset. He was not a great speaker, but he got better, and the important thing was, he made physical contact. The broad masses of a population are more amenable to the appeal of rhetoric than to any other force. All great movements are popular movements. They are the volcanic eruptions of human passions and emotions, stirred into activity either by the ruthless Goddess of Distress or by the torch of the spoken word cast into the people's midst. In no case have great movements been set afoot by the syrupy effusions of literary aesthetes and drawing-room heroes. A nation's destiny can be averted only by a storm of hot passion. But only those who are passionate themselves can arouse passion in others. It's only the capacity for passionate feeling that, like hammer blows, will open the door to the hearts of the people. In America Abolitionists of yesteryear were, and today are, White Christian U.S. citizens driven by their passions from the heart that cloud the judgment of the mind, therefore, they are anti-Constitution. Under the ratified 1788 Constitution passion cannot be legislated into crime to become law, because passion cannot be proven in a U.S. court of law by evidence of an act that intentionally caused harm. U.S. citizens have religious freedom because the 1788 Constitution separated sin and crime (Church and State). U.S. governments are not God to judge sin, and U.S. citizens are not God to judge the other fellow's sin. America has an unconstitutional corrupt government for over one hundred years and that government is reelected every two years by a religiously passionately corrupted U.S. citizenry. Ever since 1788 U.S. citizens have the exclusive authority and Power to choose every Member (or not choose the Incumbent) of the House in Congress every two years. If there is a political Leader in America that Leader is the House in Congress. Carolyn, I am having problems posting. I'm sorry, Allan. I'll report it to my administrator.